A CRM is essential to the success of any business that has customers. Remaining productive all day while building strong business relationships is crucial to advancing the success of any business...particulary small business. Imagine following up on new leads without delay or having an immediate answer to a question from your best customer – even if you are out of the office? It’s hard to stay on top of all those tasks when have a small team. That's where a Customer Relationship Management (CRM) solution can help. With the right CRM strategy and solution, you can improve your processes for building and maintaining business relationships. This will enhance your professional image, build sales and free up valuable time for your team. There are hundreds of CRMs on the market, each claiming to be the best. While each one may promote specific features and benefits, it is really important that you are using the right CRM software for your business to ensure a return on your investment. At Act Today, we have been working with Act! CRM since 1992 and have implemented CRM solutions for thousands of businesses worldwide, from single user sites up to 100+ user corporations. We have seen a lot of CRMs come and go and we have seen customers move on to “bigger and better” only to return to Act! a year later. We understand CRM and how the current technological and business environments interact. Small to mid-size business. Whether you are an individual, have a small business or part of a large organisation, we can assist you in implementing a CRM solution that suits your business. A range of industries. We provide CRM solutions to clients from varying industries, such as financial services, hospitality, manufacturing, technology, recruitment, medical, professional services, real estate and many more. Varied functional roles. While CRM benefits are generally known for helping to boost the success of sales professionals, anyone with business contacts will benefit from incorporating a CRM solution into their business systems such as your management and marketing teams. 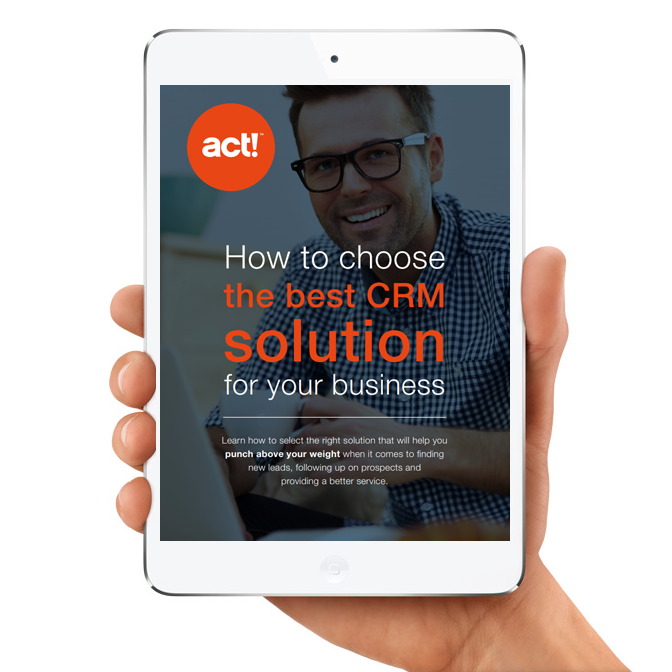 Contact us today to discuss your CRM requirements or download your free e-book. Find out how to select the right solution that will help you punch above your weight when it comes to finding new leads, following up on prospects and providing a better service. As Managing Director, Cate Dempsey works closely with CEO Michael Bryant in the strategic direction along with the day to day management of the core team for Act Today. Cate has a deep understanding of the business, starting as an Act! Consultant she has an inside view of what clients need and want when it comes to CRM. Cate is able to bring her client facing experience into the strategy and decision making process, enabling Act Today to be very focused on customer experience and satisfaction. Learn how to select the right solution that will help you punch above your weight when it comes to finding new leads, following up on prospects and providing a better service.